Cat food can be classified into dry, moist, and semi-moist foods. Each one has its advantages, and Ragdolls need different types of food at different stages. Kittens need mostly breast milk and moist food, while adults require more protein and dry food. Pregnant Ragdolls have special dietary needs that change throughout the pregnancy as well. 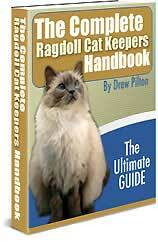 Ragdoll kittens should be exclusively breastfed for the first four to five weeks. Cat milk contains all the nutrients necessary for the kitten's growth, including antibodies that help prevent disease. Breast milk also passes on other antibodies that the mother produced to fight previous diseases. Extra food should be provided after four to five weeks, as the kitten needs more nutrients to support its rapid growth. Introductory food should be easy to digest. Mix canned food with warm water or kitten replacement milk until it forms a loose paste. Do NOT use regular cow's milk, this is too heavy for kittens and may result in indigestion. After another four to five weeks, your kitten should be ready for dry food. To make the transition easier, moisten dry food with a little warm water in the first few feedings. It's also important to choose high-quality supplements to dry food, some of the good brands are Iams, Science Diet, and Nutro Kitten. Science Diet Feline Growth is popular among Ragdoll kittens. Supplements can be given twice a day with morning and evening feedings. You can switch to adult food after about 12 months. Ragdoll kittens have delicate stomachs, so take extra care in choosing kitten food. Food should always be warm or slightly above room temperature. Discard any food that has been left out for more than 30 minutes, especially in the summer. Bacteria grows fast in warm, wet foods and may upset your kitten's stomach, or even cause food poisoning. To keep from wasting food, just observe how much your kitten eats at a time so you know how much to prepare per feeding. Houseflies can easily contaminate kitten food, so keep your feeding area as fly-proof as possible. Wash the feeding bowl everyday with hot, soapy water and replace water in the drinking bowl several times a day. Wash the drinking bowl at the same time and refill with fresh water. Table scraps can be given occasionally, but don't make regular meals out of them. Cooked human foods lack the nutrients necessary for your kitten's growth. Generic cat food from groceries are better, but Stellarhart recommends high-quality foods from specialty pet stores. Also, cats don't like the smell of plastic and metal containers, so use only glass drinking bowls. Dry foods are generally better for your Ragdoll Cat, except in the breastfeeding and introductory stage. They work your kitten's chewing muscles and help keep the teeth white. Dry food consists mostly of meat and vegetables, and can be moistened or served dry. Serving them dry allows your cat to nibble throughout the day, rather than eating one large meal at a time. Dry food should contain about 9 to 10% moisture, 8% fat, and 30% protein. Moist food contains about 75% moisture and equal amounts of fat and protein. Not all moist foods are the same, some are all-meat or all-fish, while others are a mix of meat and vegetables. The former should not be used for regular meals, as your cat can get "addicted" and refuse to eat anything else. The small "treat" cans of variety foods are usually all-meat or all-fish. As with kitten food, moist foods should be warmed to room temperature before serving. Semi-moist food has about 35% water, 27% protein, and 7% fat. Most of them are nutritionally balanced, highly palatable, and can be left out for nibbling, but they spoil faster than dry food. Fish may be good for cats, but it can't cover all their nutritional needs, and too much of the same nutrients can be harmful. Tuna is rich in polyunsaturated fatty acids, which need vitamin E to break them down. Too much tuna in your cat's diet can cause yellow fat disease (steatitis). Milk is rich in water and carbohydrates, but many cats are lactose intolerant and get digestive problems a few hours after drinking milk. Regular cows milk can cause diarrhea and loose stools, which can lead to malnutrition and dehydration. If your cat likes milk, use replacement cat milk instead. Cats love the small of catnip leaves, but it can cause short-term behavioural changes. Catnip is a hallucinogen and may put your cat in a state of near delirium. Some effects include rolling, rubbing, chasing phantom mice, or simply staring into space. Although it's not addictive, catnip has no place in your cat's diet. It may be more convenient to feed your cat and dog from the same dish, but it's not very healthy for either pet. Cats need more protein, taurine, preformed vitamin A, B-complex vitamins, and arachidonic acids, which they can get from a meat-heavy diet. A lack of these nutrients can make your cat seriously ill, and an overdose can have the same effect in dogs. A popular belief among cat owners is that diets low in ash can help prevent urinary tract infection. But that's only partly true. "Ash" is not a single nutrient, but is actually a group of minerals including calcium, copper, magnesium, phosphorus, and zinc. Lower levels of magnesium keep urine at its normal, slightly acidic state, but reducing other minerals will have no effect. Alcoholic beverages. Alcohol can be toxic and cause fatal complications. Baby food. Many baby foods contain onion powder, which can be harmful to the blood. Fish and meat bones. Small fragments can cut into the digestive tract and cause bleeding. Caffeine (coffee, tea, chocolate). Caffeine can affect the cat's heart and nervous system. Citrus oil extracts. This can cause stomach upsets and vomiting. Fat. Animal fats can cause pancreatitis. Try not too feed your cat fatty cooked meats, or at least trim the fat off first. Grapes and raisins. These contain a toxin that can harm the kidneys. Human vitamin and iron supplements. Excessive iron can damage the liver, kidneys, and the lining of the digestive tract. Liver. Liver is safe in small amounts, but too much can cause vitamin A toxicity. Macadamia nuts. Unknown toxins in macadamia can damage the muscles, digestive system, and nervous system. Marijuana. Marijuana can cause vomiting, depression, and irregular heart rate. Mushrooms. Some mushrooms contain highly toxic substances that can affect multiple systems and even cause death. Onion and garlic (powdered, cooked or raw). These contain disulfides and sulfoxides, which can cause anaemia. They are harmful to both cats and dogs, but cats are more vulnerable. Persimmons. Persimmons seeds can block the intestines. Potato, tomato and rhubarb. These can be harmful to the nervous, digestive, and urinary systems. The leaves and stems may also be toxic. Raw eggs. Eggs can damage your cat's hair and coat. Raw fish. Raw fish can deplete the nutrient thiamine, which can cause seizures, appetite loss, or even death. Salt. Salt and salty foods can cause electrolyte imbalance, a potentially fatal condition affecting the heart and nervous system. String. Strings from beans and other vegetables may not be digested, which can cause blockages. Sugar. Sweets are high in empty calories, which can lead t obesity, diabetes, and dental problems. Yeast dough. Yeast can expand in the stomach during digestion, causing it to rupture.